Since the introduction of the first-generation model in 1995, the Honda CR-V has continuously improved throughout each generation. This latest evolution of the popular compact SUV has been developed to exceed the expectations of customers, with enhanced and unique characteristics. The new CR-V now features a range of sophisticated technologies and superior quality throughout.In a first for a Honda SUV in Europe, the all-new Honda CR-V will be available with advanced hybrid powertrain technology. The hybrid system uses intelligent Multi Mode Drive technology (i-MMD) combining two electric motors, an Atkinson-cycle petrol engine, Lithium-ion battery and a fixed-gear transmission to deliver high levels of refinement, responsiveness and efficiency. It is available in both FWD and AWD formats.The CR-V has a fresh and sophisticated exterior design, with broader, muscular wheel arches, sharper contours on the bonnet and rear quarters, as well as the latest Honda family 'face' with its signature headlight graphic.The new model raises the bar in terms of interior quality, sophistication and spaciousness. Benchmarked against premium-brand products, it delivers improved ride quality, steering response, body control and NVH management. Evolved in every way, the all-new CR-V delivers more comfort, convenience and connectivity than ever before.The all-new CR-V's slightly larger exterior proportions, longer wheelbase and wider stance enable a significantly larger interior. Best-in-class space efficiency is highlighted by the generous space available for all occupants, as well as a wider, deeper boot with a longer load bay. A hands-free power tailgate enables convenient loading access. The all-new 2019 Honda Passport is designed for adventure-seekers who want the superior off-road capability of Honda's available i-VTM4 torque-vectoring all-wheel drive, the power and towing capability of its 3.5-liter i-VTEC V6, and the more personal and rugged character of a five-passenger SUV. 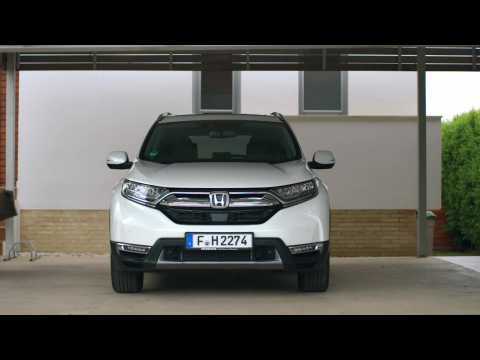 Within the Honda SUV lineup, in size and price, it slots between the refined and compact-size CR-V and the larger, three-row family-focused Pilot.The 2019 Passport is based on Honda's reinforced unibody midsize light-truck platform, featuring a fully-boxed floor structure, the latest generation of Honda's proprietary Advanced Compatibility Engineering (ACE) body structure along with a sophisticated fully independent suspension offering exceptional on- and off-road driving performance.Passport's rugged yet modern exterior styling comprises standard 20-inch wheels, aggressive black grille, and increased ride height with more athletic proportion and stance compared to the three-row Pilot. Inside, Passport offers best-in-class passenger space and total interior volume and features a large "basement" cargo area ideal for storing dirty gear or keeping valuables out of sight.